Residents and businesses in Michigan take great pride in their home, from Detroit to Ann Arbor and throughout the Great Lakes state. If you’re a community bank or mortgage lender in Michigan, you’ve taken on an important duty and a commendable one, helping Michigan residents find homes and Michigan businesses get their start. But to do that for the community, your institution needs to make money. To do that, you need a sufficient number of high-value loans. Part of getting those loans is proper, cost-effective and efficient evaluation and appraisal, which is just what you’ll get when you choose SAMCO Appraisal Management Company. For the last few years, conventional wisdom has been that the housing lending market in Detroit has been all but dead. That is no longer the case. If you’ve had the strength to hang on, or you’re looking to enter the market right now, it’s a whole new world. The future of lending in Detroit and throughout Michigan looks bright. In fact, the number of mortgages in Detroit has doubled since 2014, and home assessments in 2018 are experiencing a rise for the first time in a decade in a half. Detroit is not all the way back yet, but with quality community banks and lending institutions taking the right approach to mortgage loans, they could get there very soon. If you plan on being one of those institutions, SAMCO is here to help as your Michigan AMC. We can find skilled, honest appraisers for your properties who will never come anywhere near your loan officers so you will never have to be concerned about a compliance violation. Speaking of compliance, if worrying about navigating USPAP and Appraisal Standards is giving you fits, it’s another great reason to talk to SAMCO Appraisal Management Company. Our comprehensive review process is a thorough, affordable way to ensure compliance. This is only part of the wide range of valuation products and services that we can offer to enhance your lending institution. We are happy to put together a custom appraisal management program as well as custom reporting using real-time data to wholly address any and all appraisal concerns. Building a financial lending institution with a strong portfolio of quality loans isn’t easy. It takes a lot of hard work and know-how, but it can be done. Smart banks know that having the right partners can be half the battle. 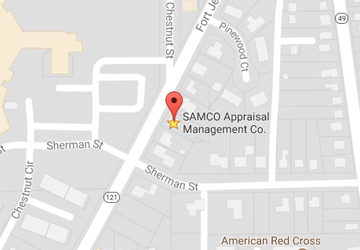 SAMCO wants to be that partner when it comes to your appraisal management needs. We’d love to talk to you more about how we at SAMCO Appraisal Management Company can save you time and money and add value as your Michigan appraisal management company. Please give us a call today at 888-832-1129 or contact us online so we can discuss the next steps for your Michigan lending success.